DA Girls Sweep Medals in Final 15U Tournament of the Season! It was a beautiful day for a Durham Attack Medal Sweep in the 15U Girls Bugarski Cup, the final 15U OVA tournament of the 2013-14 season, Championship East Division on March 22, 2014! After a long, hard-fought day, Durham Attack U15 Havok 2, Durham Attack U15 Flare and Durham Attack U14 Black (Legacy) all found themselves in the Medal matches. After starting the morning with a not-so-close faceoff in favour of the more senior team, U15 Havok 2 and U14 Black (Legacy) found themselves facing each other again in the Gold Medal match, and Durham Attack U15 Flare faced off against U14 Scarborough Titans Tektonics for the Bronze medal. 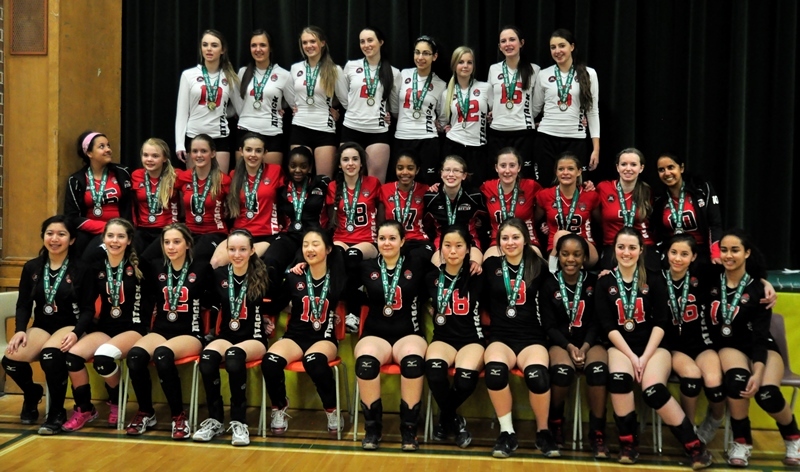 With provincials-calibre tension and excitement, the three Durham Attack teams triumphantly took all the medals – Gold for U15 Havok 2, Silver for U14 Legacy, and Bronze for U15 Flare! An excellent way to show the Durham Attack power as they end the tournament season and head into Provincials!! The three DA teams posed proudly with their Gold, Silver and Bronze medals!